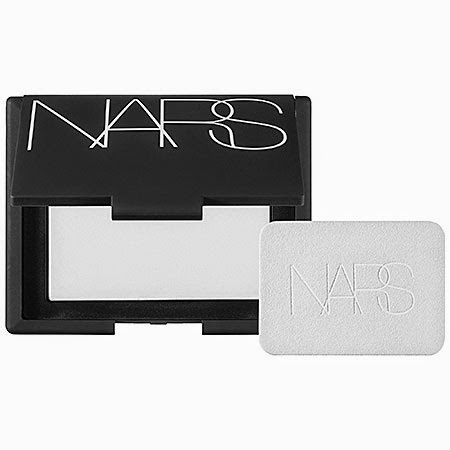 Only Francois Nars could come up with such a genius product - a pressed powder that mattifies oily areas, gives skin an even appearance and ALSO gives a luminizing finish. NARS Light Reflecting Pressed Setting Powder Translucent Crystal is the perfect finish to my makeup. Just a few swipes across the powder with my brush or the accompanying makeup puff (shown, above), and I had a look I loved. I looked polished and matte in my t zone, but still with a slightly glowy look. The powder filled in tiny pores on the nose, so the effect was velvety smooth. I loved also using this as a setting powder under my eyes after concealer as well. The fact that this powder is completely translucent is another big plus, especially for women of color. I had no trace of grey or white finish on my skin, and it worked equally well over my foundation and BB Cream, as well as over bare skin when I just wanted oil control. Even if you're heavy handed with NARS Light Reflecting Pressed Setting Powder Translucent Crystal, it's amazing that it still doesn't cake up or look heavy. Speaking of oil control, after applying in the morning, I was amazed at how well it kept my T-zone looking oil-free. I generally only needed to touch up just once more in the late afternoon - and that's it! My makeup looked fresh and kept it's color and consistency all day long as well. It never got dry, flaky or cakey as the day went on. NARS Light Reflecting Pressed Setting Powder Translucent Crystal is now the only face product I have in my bag for touch ups. It comes with a very nice black NARS satin pouch with a band to hold the case and powder puff, which makes it ideal for travel as well. Note: When first using NARS Light Reflecting Pressed Setting Powder Translucent Crystal you will need to swipe through the pan with some pressure a few times with a brush or your fingers to get trough a protective layer on top of the powder.